If you havent heard, you betta listen! Big P.I. is one of the hottest artist hailing outta the mid west, making hits like "$he Got It" ( Http://bln.kr/E50 )that hasBeen in theDanger Room with Dj OneTymeon The Juices 107.3 this cat is no RN (Regular Ni**a). Dude is working. The boy is versitile and can rap about anything! from songs like "My Kicks Beat'n" Ft. Young Rhome of Huey Ent ( Http://bln.kr/QYT )to his poetic flow on "Ms Pretty Brown Eyes". He got some for everybody on his upcoming INDEPENDENT album "The Influence" Currently representing Hustle Hand Ent. based out of Toledo, OH he has made a nice name for himself. 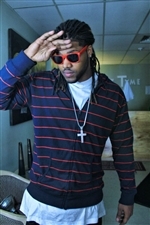 If you want a rapper with tremendous swagg check this dude out! I promise it wont be a waist of your precious time.